Super Smash Bros. For The Wii U made two big debuts today: One, its first Evo Sunday showing, and the second on national TV, as it aired live on Disney XD and ESPNU. It’s fitting that in this year of new horizons for Smash 4, one player would take the opportunity to make his presence known. 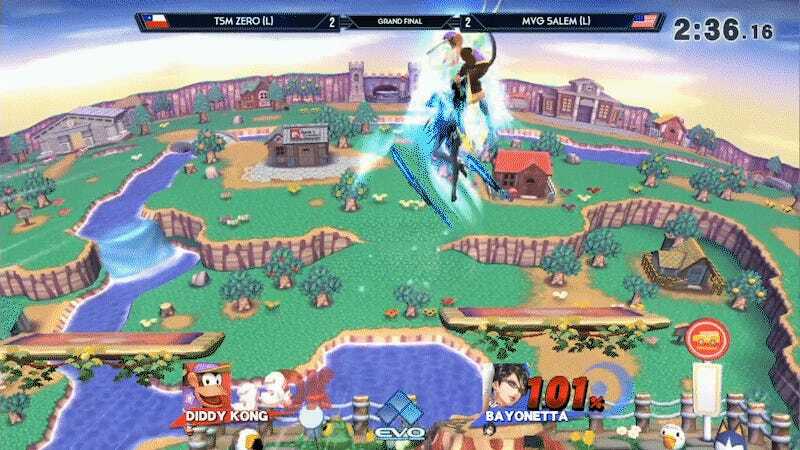 After battling through a litany of Smash’s finest, Saleem “Salem” Akiel Young emerged as Evo 2017's Smash 4 champion, 3-2 over Gonzalo “ZeRo” Barrios. Barrios came into this year’s Evo with a chip on his shoulder, after exiting at third last year. The undisputed top player in Super Smash Bros. For Wii U, a win at Sunday’s finals would cement that legacy, a cherry on top of an already stellar year. Young, meanwhile, had been gradually climbing the spots at various tournaments throughout the year, giving trouble to pros like Barrios in multiple sets. After taking down top competitors like Ken, Tweek, and Larry Lurr, Young had his sights set on the biggest boss in Smash, the culmination of a breakout run for one of the best Bayonettas in the world. Young came out of his corner swinging with a solid game 1 win against Barrios. Ranked 11th on Panda Global’s Smash 4 rankings versus Barrios’ no. 1 position, Young looked like more than a match for the Diddy Kong player. Young’s positioning and technique on Bayonetta was impeccable, always coming back to the edge and even maneuvering under the stage to stay in the game. Barrios was no pushover though, landing punishing hits on Diddy Kong for every whiffed Bayonetta combo. Across four games, the two battled back and forth until it came to the final match of the set on Smashville. A tense back and forth, Young had Barrios on the ropes and in the red triple-digits, yet he was still always one good Diddy slap away from death. A slight misstep gave Young the opening he needed. One kick reset the bracket, and the players now both stood just three games from the trophy. Another tense set of games led into another 2-2, and a single game would decide the tournament’s outcome. 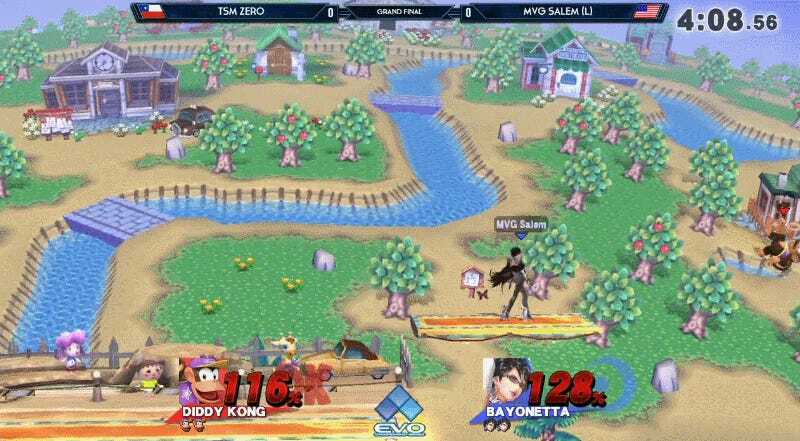 Young’s Bayonetta play was still aggressive and conducive to explosive play, but Barrios seemed to have internalized it, reading a few moves ahead as each stock went by. Barrios drew first blood, leaving Young to battle back from a stock deficit. The Bayonetta eventually evened the count, but not before Barrios had chalked up a good amount of damage on Young’s last life. It came down to a single leap up into the air for both, fighting up at the very top of the screen until a single red blast declared the outcome: The underdog had done it. Saleem “Salem” Akiel Young took home first place, completing one of the best underdog runs of the tournament. You can watch the full grand finals on Twitch here.